Depending on its location, a first aid kit may contain any number of items specific to its predicted use. Still, all first aid kits should contain certain items such as Band-Aids, antibacterial ointment and bandages. A first aid kit in an auto repair garage, for example, should probably have a supply of woven knuckle bandages. After all, mechanics are known for busting knuckles when turning wrenches, and these bandages will provide the protection needed to keep on working while staying clean. These particular Swift knuckle bandages incorporate non-stick, breathable pads and are resistant to oil and grease. 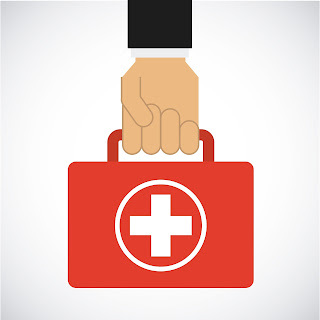 Realistically, every home should have a comprehensive first aid kit and a smaller version should probably be carried in each vehicle and brought along in the event that you go camping, hunting, hiking, etc. These first aid kits will typically be stocked with rubber, surgical gloves, protective masks, disinfectant wipes or antibacterial towelettes, eyewash, a selection of different sized sterile bandages, adhesive tape, rolls of gauze, cotton-tipped swabs and more. Of course, for a family member with severe allergic reactions to things like bee stings or nuts, you'll absolutely need to have an Epi Pen (Epinephrine Auto Injector) on hand. Consider others in your family, such as the very young or elderly, who may require special items in your first aid kits and then stock them accordingly. It’s better to have too much than too little. Scissors, tweezers, cold packs, a first aid manual, safety pins, finger and arm splints and a thermometer are all worth considering. Your first aid kit, especially the one in your home, should be somewhere conspicuous that everyone knows about but out of reach for very small children. While you can buy a kit already made up with the items most commonly needed, you can also opt for a homemade first aid kit. One other important ingredient in having an effective first aid kit is user knowledge. You must be familiar with the items in your kit and how to use them. An Epi Pen is a good example. When someone is having a violent reaction to a bee sting, that could literally kill them in a very short time, is not the moment you want to stop and learn how one of these devices is operated properly. Get some kits, and familiarize yourself with their contents. Always resupply after items are used.